This past October, global population surpassed 7 billion people. In 1930, the population was just 2 billion. That's a 350% increase in a mere 80 years! Improvements in healthcare and agriculture are allowing people to live longer and have more healthy children, giving way to rapid, exponential population growth. World population is expected to swell to 10 billion by the end of this century, and then plateau. Can the planet hold this many people? As it turns out, yes. Standing shoulder to shoulder, 7 billion people would fill only the city of Los Angeles. Similar interesting facts and statistics can be found in this short National Geographic video about the significance of 7 billion people. Does Earth have enough natural resources for this many people? Will we be able to afford them? What about jobs? Can countries afford healthcare for this many people? And what of conflict and war? The implications, challenges and opportunities of this and future population milestones are many. But we at Leyendecker & Associates agree on this: If there are a few kids like this sixth grader walking the halls of America's schools today and more that follow, there is hope. With hungry and passionate people like this youngest-ever Ted speaker, we will be carried by the ideas, innovations and solutions of future stars akin to those ideas, innovations and solutions that gave us the modern comforts that enabled our population boom. Please see below for more articles on the implications of 7 billion. 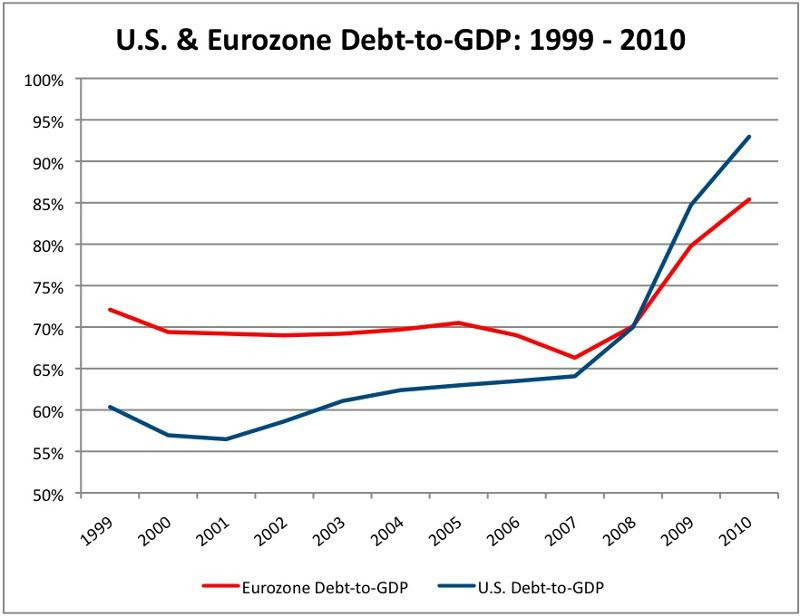 Are we days, weeks, months or years from a Eurozone implosion? Or are there more rabbits in the hat to be pulled by those government and financial services magicians? We lay folks just don't know, and we certainly can't time any dramatic changes one way or another. So for now everyone should just keep their seat belt tight and enjoy the roller coaster ride. How might a Euro implosion affect the U.S.? It is certainly hard, if not impossible to project something one has never experienced. But it certainly seems we are living in times that will make the history books. There really is no such thing as economic Armageddon. The world will not come to an end, but as history has shown it always changes. Sometimes it may even change much more dramatically than everyone expects. One comforting perspective may be is that we are all in this together. If everything falls apart, then it falls apart for everyone. There is little more equality than all of us being broke together. At the end of the day all our weaknesses are glossed over when blessed with the momentum of growth, but today we can't seem to find any growth that isn't government induced. Organic growth? Expect we will soon spend considerable time wondering and looking to better understand where all the money comes from. Financial services firms seem to be in such an insecure position these days that little hiring is going to happen for a while. Although we have yet to experience the next Lehman event, with Europe teetering on the ropes of economic implosion, there likely will be very little hiring in financial services until the market settles down. Should Europe fall, expect mass layoffs, not just in financial services, but across all industries. This is not just a Europe issue. This is a global issue. Our wonderful interconnected economy is now interdependent. If one link in the bicycle chain breaks, the whole bicycle is likely to stop working. There's always going to be some replacement of people who retire or go off to do something new and different. But if liquidity contracts, so too will employment. Investment performance and operating companies will also suffer if liquidity shrinks. Odds seem good that we will soon return to robust hiring in the workout, turnaround and liquidation markets. The key to hiring in financial services seems to be how long it takes for the economic knife to fall. Employment will constrict until we reach the bottom or this next liquidity cycle. But at some point, we should see robust hiring in financial services as that industry reboots and adapts to another new Glass-Steagall type world. Looking at the state of sovereignty in the developed world of Europe, Japan and the United States, we plainly see dysfunctional governments and policy. Each seems capable of only one form of policy - kicking the can down the road by agreeing to throw in yet more money to patch over the real problem, or by changing the rules of the game so that the problem gets hidden from view. No one has yet to develop a common sense policy path that addresses the root of the problem. And yet, no one really seems to understand the real problem. We grew debt for some reason. What is that reason? Treating symptoms doesn't necessarily cure the disease. Even the current slate of Presidential candidates seems nothing but an extension of the current troubled system. Who would want to be Captain of the Titanic after it has already hit the iceberg anyway? You don't save passengers on a sinking boat by selecting a committee to meet on the deck to compromise on a rescue plan, yet that's what we're doing. Has compromise triumphed over common sense? Is compromise now the benchmark of success, nothing more than an extension of our "everyone who participates gets a trophy" culture? How did we come to replace common sense with compromise? What caused us to replace empowerment with entitlement? And at what point did we become so afraid to make hard decisions, even if for the greater good? Common sense seems to rule the day only after all else fails us. Given the fragile state of our Western macroeconomic environment, common sense may very well soon return. It might have to. But it would necessarily come at the expense of the comfortable status quo we have been living in for several decades. If you are running a company or managing your personal career, be cautious during the good times, for they likely will not last forever. Europe teeters on the brink. It appears that our current economic policy is just to wait for the other shoe to drop in the Eurozone to see what it will mean for us. We were curious about how the U.S. debt-to-GDP ratio compared to that of the Eurozone, which we all know from just a glance at the headlines is in bad shape. With our debt-to-GDP nearly 8% higher than theirs, one has to ask: Will it really require the other shoe to drop in Europe to have a Euro-style crisis of our own? In this short video, NPR takes a clever look at how our population grew so rapidly in such a short amount of time. Learning that the global population will reach 10 billion in less than 100 years might make it hard to believe, but population growth is actually already slowing. This fascinating Economist article takes a look at various numbers that have ebbed and flowed along with population's growth, with some counter-intuitive results. It seems reasonable that more people could mean more conflicts and wars, particularly over scarce resources. However, conflicts and their consequent deaths seem to have peaked and are in decline. More people won't necessarily translate into more pollution either, as epicenters of current population swells sit in countries that emit small amounts of carbon dioxide. To feed 7 billion people, agriculture productivity will have to increase, but less so than it had to from 1970 to 2010. The food access challenge stems more from the supply side - sufficient farmland, or lack thereof - not the demand side. Read on for perspectives and context about historical population dips and swells and their general economic significance, as well as the larger meaning of dropping fertility rates across the globe. Does the planet have enough natural resources to support 7 billion people? Certain forecasts show 3 billion new people joining the middle class ranks in the next 20 years, which will cause natural resource demand to skyrocket as access wanes. Will these people be able to sustain natural resource costs already on the rise and susceptible to price volatility? In their in-depth look at the world's resource challenges, McKinsey lays out possible solutions by expanding supply and finding innovative ways to extract, convert and use resources. They also look at impediments to implementing possible solutions, namely their high cost, which can be alleviated by policy that focuses on three key areas identified in the report. Follow this link above for a synopsis or the link that follows to download the PDF of the full report. Nearly 2 million Americans are over 90 right now, triple the number just 30 years ago. Advances in healthcare mean we're living longer. But this poses great challenges, since end of life care is incredibly costly, not to mention the further strain it puts on public retirement programs. We can expect that the over-90 rate will only grow. With the birth rate outpacing the death rate, economies will have to come up with more resource and financial means to support an expanding aging population. NPR: Along with humans, who else is in the 7 billion club? Estimates show that humans are the largest animal to reach such huge levels of population. Only the brown rat and the domestic chicken outnumber us. Of large mammals, the next biggest population is cattle at only 1.4 billion. Humans appear to be in a pretty exclusive population club. Your connection to Kevin Bacon just got a little closer. According to a recent study by scientists at Facebook, the average person can be connected to any one of the 7 billion people on the planet in just 4.74 links. Despite our population growth, technology continues to shrink the world. WSJ: Whose economy has it worst? On any given day, it's hard to tell who's in worse shape, Europe or the U.S. And it's becoming clear that China's problems are mounting with potentially grave global ramifications. Despite a high probability of pain for the world's largest economies in the short-term, the U.S. remains in the strongest position for long-term economic health, according to Roubini and Bremmer. Thanks to certain advantages they enumerate in this article - including our higher fertility rate - the U.S is best poised to see economic growth sooner than other leading global economies. Study, read and listen to the things that really smart and successful people think are great to gain insight into what makes them great, suggests this article's author. To that end, the author highlights his favorite parts from a recent interview with Amazon's Jeff Bezos, whom he deems the next Steve Jobs, and Amazon's first shareholder letter in 1997 to distill Amazon's incredible success to 6 key points. It seems we can't go a month without witnessing another highly public fall from grace. This month, we saw the once vaunted Jon Corzine meet his career demise. Where once our meritocracy delivered scores of successful and prosperous people from humble beginnings, it now seems to deliver scores of over-privileged, over-educated people too smart for their own good, giving way to their own downfalls. Editorialist Ross Douthat looks at the current state of our meritocracy, where the smartest guys in the room are driving us over the cliff. He outlines the qualities that must be demanded from all leaders today to change course from destructive to sustainable ends. The veteran unemployment rate is 12%, well above the national unemployment rate. Former Marine Rye Barcott debunks misconceptions that might cause some employers to avoid hiring veterans. By making people aware of the issues standing between veterans and employment, Barcott hopes to encourage people to hire these well-skilled, dedicated men and women. He also borrows from military leadership practices to point out that while most private sector leaders define their mission, most fail to fulfill the second tenet of military leadership, which is taking care of your people. Since the 1970s, the ratio between employment rates and GDP has been declining. Fewer jobs are being created with GDP growth. While the exact breakdown is unclear at this point, less manufacturing, technology-enabled productivity growth and outsourcing are likely contributors. The trend means GDP will have to grow at rates greater than historical averages to ease unemployment.